All of the Halloween Events are now running and will continue until 5 November. We hope you have enjoyed Halloween this year and we should have even more fun for Halloween in 2008! Also, remember that the limited edition Halloween Account Upgrade items will all retire on 5 November so this will be your last chance to purchase them! From now until the 5th November, we'll be adding new prizes to all of the Halloween Events but this is the last news update we will have related to Halloween! We have so much great stuff planned for November too.. here is a preview of the new pet, Rusty which will be avaliable from a brand new mission! Can you find the Trick or Treat 07 avatar??? The final event of our Halloween Celebrations has just started. It will end on November 5th with all of our other halloween events. To take part in Character Trick or Treat, all you need to do is dress your character up in a Halloween Character Costume. Then you can visit the profile of any player that is currently online, hit the Trick or Treat button and get a prize! You can only Trick or Treat each person once and you will receive MP or an item. All of these item prizes will retire at the end of this event too! If you are dressed up really well for halloween, you might even scare the other player so bad that their character has to walk around the site looking terrified! We have added new levels to the Undying Woods Goals. That means there is currently 31 levels to complete and each level gradually gets harder. Can you find the Undying Woods avatar we've just hidden? The Lottery has been drawn for this week. Easyrhino is the winner of the 995,500MP Jackpot with the winning numbers of 19, 24, 22, 1, 13 and 15! Congratulations! Last Week's Raffle has now ended. summerblah is the winner of the Red DNA and 100,000MP prize with the winning raffle ticket number 17781! Congratulations! Make sure you buy your tickets for today's raffle - only 10MP per ticket! There are some new Halloween Snowman Prizes for you to get! If you are lucky completing his quests, you may get a Halloween Snowman costume for your character to dress up as for Trick or Treating! 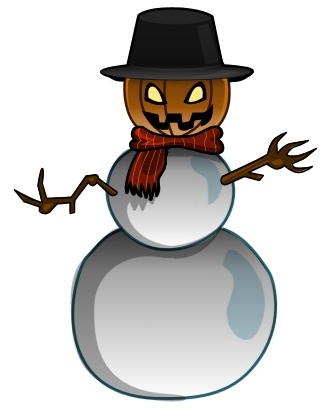 Can you find this Halloween Snowman Avatar? Because of the huge demand for Halloween Treats, we have doubled the amount of these items being donated to the Pot of Gold! A new Pumpkin Hunt has just started for 2007! It will last 3 weeks, starting 27 October. As you browse and play the site as normal, check out every page for a Pumpkin in a box. When you find it, click it and you'll get a prize! The 250 different players who collect the most pumpkins will receive 1,000,000MP and a limited edition RIP Trading Card! 25 lucky players who have collected more than 100 pumpkins will also be randomly selected to win a retired Halloween Costume! You may also find this Pumpkin Hunt 07 hidden avatar! The old Limited Edition Account Upgrade items have now been removed, retired and replaced with Halloween items. These will all retire by November 5th 2007! 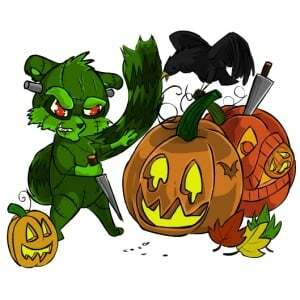 The Halloween Knutt and the Halloween Poera have just been released! The Pot of Gold will now have free Halloween Treats donated to it randomly every few minutes! The Lottery has been drawn for this week. kevmcg1 is the winner of the 1,111,900MP Jackpot with the winning numbers of 20, 3, 13, 6, 25 and 7! Congratulations! Last Week's Raffle has now ended. hunterhottie1995 is the winner of the Red DNA and 100,000MP prize with the winning raffle ticket number 34629! Congratulations! Make sure you buy your tickets for today's raffle - only 10MP per ticket! Its time to celebrate Halloween in the world of Undying Woods! Elger has taken the time off from doing quests during this holiday season. Instead, you can visit her with your pet dressed up for halloween to go Trick or Treating for free once every 20 minutes! All you need to take part is a pet wearing a Halloween, Nefarious, Skeleton, Ghost or Witch costume! The Lottery has been drawn for this week. juniorjones2 is the winner of the 1,186,500MP Jackpot with the winning numbers of 12, 21, 15, 19, 24 and 3! Congratulations! Last Week's Raffle has now ended. MortishaMay is the winner of the Red DNA and 100,000MP prize with the winning raffle ticket number 57000! Congratulations! Make sure you buy your tickets for today's raffle - only 10MP per ticket! Our newest Dress Up Game has just been released. This doll maker is Miley Cyrus who is also Hannah Montana. We have arranged some of the clothes, shoes and hair styles avaliable for Marapets dolls to look like what we think would be Miley Cyrus. You can play with the doll maker to dress up Miley Cyrus. If you like some of the clothes or hairstyles, you can get them on the site for your own dress up character! The hairstyles are now avaliable at the Salon, and the clothes are avaliable for free at the Clothing Rack. Our newest Dress Up Game has just been released. This doll maker is Shakira. We have arranged some of the clothes, shoes and hair styles avaliable for Marapets dolls to look like what we think would be Shakira. You can play with the doll maker to dress up Shakira. If you like some of the clothes or hairstyles, you can get them on the site for your own dress up character! The hairstyles are now avaliable at the Salon, and the clothes are avaliable for free at the Clothing Rack. We have just added 5 new Hairstyles to the Beyonce Doll Maker and the Salon. We have added 12 new levels to the Undying Woods Goals. That means there is currently 23 levels to complete and each level gradually gets harder. Our newest Dress Up Game has just been released. This doll maker is Beyonce. We have arranged some of the clothes, shoes and hair styles avaliable for Marapets dolls to look like what we think would be Beyonce Knowles. You can play with the doll maker to dress up Beyonce Knowles. If you like some of the clothes or hairstyles, you can get them on the site for your own dress up character! The hairstyles are now avaliable at the Salon, and the clothes are avaliable for free at the Clothing Rack. The Lottery has been drawn for this week. gymrocks is the winner of the 758,000MP Jackpot with the winning numbers of 14, 1, 2, 3, 4 and 5! Congratulations! Last Week's Raffle has now ended. HIPHOPHUN is the winner of the Red DNA and 100,000MP prize with the winning raffle ticket number 23977! Congratulations! Make sure you buy your tickets for today's raffle - only 10MP per ticket! The Snowman has taken halloween a little too seriously again this year! He is now only asking for halloween treats and he is giving out some new prizes, such as the Ghost Costume, Hungry Pumpkin, Graveyard Gates Stamp, a new CD and a DVD! Our newest Dress Up Game has just been released. This doll maker is Alecia Moore also known as Pink. We have arranged some of the clothes, shoes and hair styles avaliable for Marapets dolls to look like what we think would be Pink. You can play with the doll maker to dress up Pink. If you like some of the clothes or hairstyles, you can get them on the site for your own dress up character! The hairstyles are now avaliable at the Salon, and the clothes are avaliable for free at the Clothing Rack. We have just released the first of a brand new type of Games feature on the site. Its similar to Mission Games and Quest Games, called Goals. Goal Games are themed after each virtual world in Marada. At every level you have a new goal to complete related to Undying Woods. Each level gets harder to complete but you will receive a prize for completing each level. Unlike quest and mission games, you have unlimited amount of time to complete each goal level and you can only complete them once.New levels will always be added to the Goals in each world. Prizes include rare items only avaliable from goals, MP, BP, RP, Dukka Coins, Account Upgrade Credit and stats for your pets. The Undying Woods Goals is the first world to have goals and currently has 11 levels for you to complete. New levels will be added in the news to these goals all of the time, each with a brand new prize. The Undying Woods Goals have been added to the Undying Woods map. When you complete a level of the Undying Woods Goals, you will receive a cool shield on your profile, showing everyone what level you have completed in the goals! 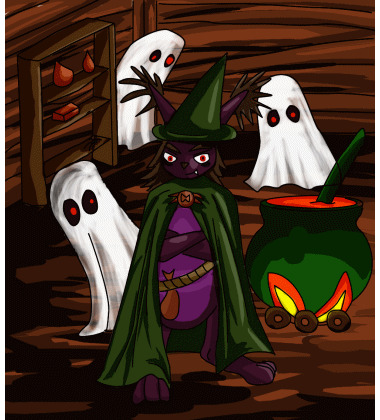 Four new Witch Pets are avaliable. The Kidlet, Lati, Xoi and Yuni. We also just added two new Hair Styles to the Rihanna Dress Up Game. You can get these hairstyles for your own doll too now at the Salon. Our newest Dress Up Game has just been released. This doll maker is America Ferrera as Ugly Betty. We have arranged some of the clothes, shoes and hair styles avaliable for Marapets dolls to look like what we think would be Ugly Betty. You can play with the doll maker to dress up Ugly Betty. If you like some of the clothes or hairstyles, you can get them on the site for your own dress up character! The hairstyles are now avaliable at the Salon, and the clothes are avaliable for free at the Clothing Rack. Our newest Dress Up Game has just been released. This doll maker is Rihanna. We have arranged some of the clothes, shoes and hair styles avaliable for Marapets dolls to look like what we think would be Rihanna. You can play with the doll maker to dress up Rihanna. If you like some of the clothes or hairstyles, you can get them on the site for your own dress up character! The hairstyles are now avaliable at the Salon, and the clothes are avaliable for free at the Clothing Rack. Three new Ghost Pets are avaliable. The Fasoro, Gonk and Zoink. Can you find the Eleka Prison avatar?